where p is the pseudo-data. The following hypothetical data set contains yields of an industrial process. Material was available from five randomly selected vendors to produce a chemical reaction whose yield depends on two factors (pressure and temperature at 3 and 2 levels, respectively). The suboptions of the RESIDUALPANEL request produce two panels. The panel of conditional residuals is constructed from (Figure 45.19). The panel of marginal residuals is constructed from (Figure 45.20). Note that these residuals are deviations from the observed data, because the model is a normal linear mixed model, and hence it does not involve pseudo-data. Whenever the random-effects solutions are involved in constructing residuals, the title of the residual graphics identifies them as conditional residuals (Figure 45.19). The predictor takes on only six values for the marginal residuals, corresponding to the combinations of three temperature and two pressure levels. 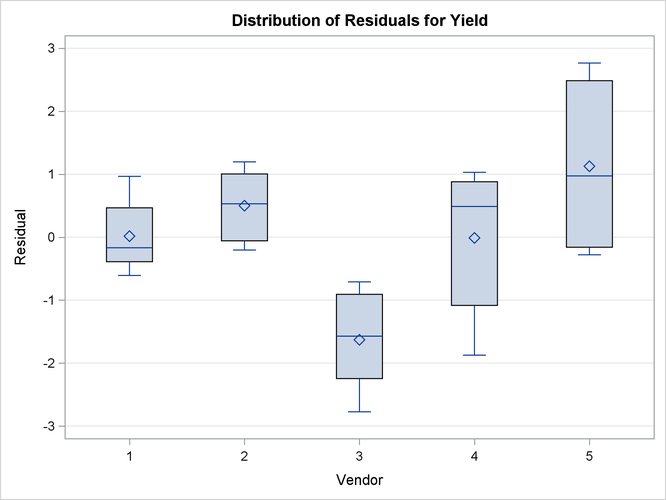 The assumption of a zero mean for the vendor random effect seems justified; the marginal residuals in the upper-left plot of Figure 45.20 do not exhibit any trend. The conditional residuals in Figure 45.19 are smaller and somewhat closer to normality compared to the marginal residuals. 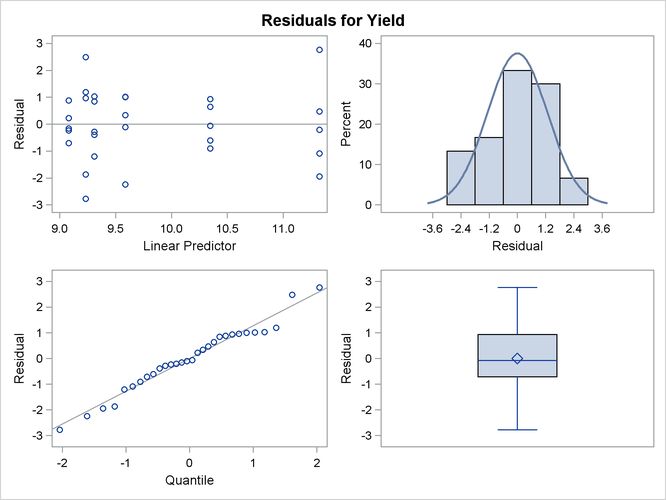 You can produce box plots of observed data, pseudo-data, and various residuals for effects in your model that consist of classification variables. Because you might not want to produce box plots for all such effects, you can request subsets with the suboptions of the BOXPLOT option in the PLOTS option. The BOXPLOT request in the following PROC GLIMMIX statement produces box plots for the random effects—in this case, the vendor effect. By default, PROC GLIMMIX constructs box plots from conditional residuals. 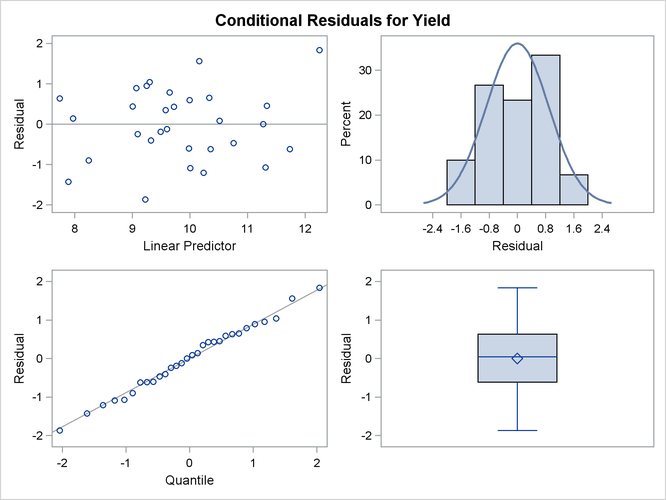 The MARGINAL, CONDITIONAL, and OBSERVED suboptions instruct the procedure to construct three box plots for each random effect: box plots of the observed data (Figure 45.21), the marginal residuals (Figure 45.22), and the conditional residuals (Figure 45.23). 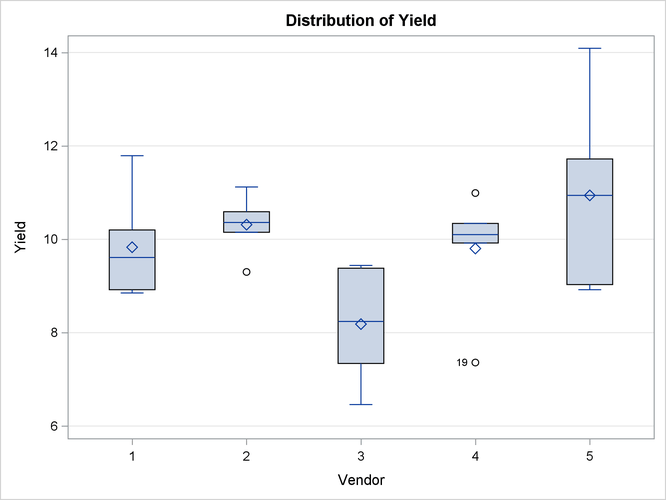 The observed vendor means in Figure 45.21 are different; in particular, vendors 3 and 5 appear to differ from the other vendors and from each other. There is also heterogeneity of variance in the five groups. 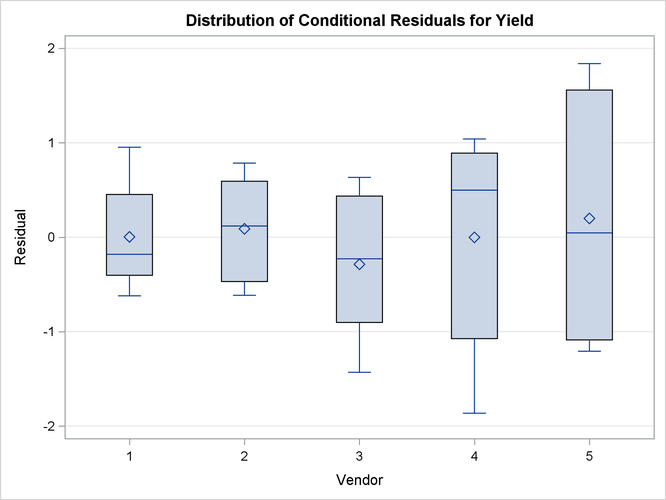 The marginal residuals in Figure 45.22 continue to show the differences in means by vendor, because vendor enters the model as a random effect. The marginal means are adjusted for vendor effects only in the sense that the vendor variance component affects the marginal variance that is involved in the generalized least squares solution for the pressure and temperature effects. The conditional residuals account for the vendor effects through the empirical BLUPs. The means and medians have stabilized near zero, but some heterogeneity in these residuals remains (Figure 45.23).